big Ideas From A Little Girl: The shopping is HOT this weekend! OMG! talk about places to spend your money this weekend! 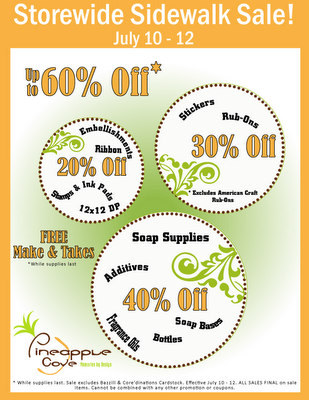 First, Pineapple Cove over at Kahala Mall is having a huge sale this weekend, starting TODAY! There will be Free Make & Takes (while supplies last) and everything in the store will be on sale (up to 60% off!) excluding only two items, Bazzill Cardstock & Core'Dinations Cardstock. Clearance will be 60% off. 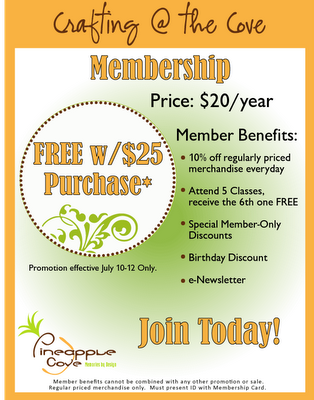 In addition, spend at least $25 and receive 1 year FREE membership to our Crafting @ the Cove Club. Sale ends July 12. My friend Linda will be helping Manle on Saturday, July 11, so if you are in the area, stop by to check it out and say hello to Manle and Linda! The shopping is also HOT at J's Knicknacks this weekend too! Starting Thursday, July 9th thru Saturday, July 11th, all Cricut products are 30% off of the retail prices. Also all Sizzix pop-up dies are 40% off of the retail prices. All sales are final, no returns or adjustments from previous purchases and does not include items on hold prior to Thursday July 9th. Finally, don't forget to check out the large selection of Hello Kitty dies at Fisher Hawaii too! If you are going there to buy your school supplies, you gotta check out the craft stuff for you! The marvy punches are also on sale, and the prices are really unbeatable! Have fun shopping this weekend...if you are signed up to my sold out class this weekend, I am looking forward to seeing you! Thank you for visiting today and HAPPY FRIDAY! Have a great weekend! OMG! I wish I could visit Hawaii! THANKS FOR THE 411 TERI! Geez, this makes me wish I was still on the island! Oh well, maybe I can get my Mom to shop for me? LOL! Wow!! So much sales going on!! Thanks for the 411.. whatever happen to your other friend that sold soap stuffs? Enjoy your class sister... hopefully it's not too hot on Sunday. Girl, so glad you were able to stop by. Always good seeing you!! Too bad you missed Linda & Cami who were here on Saturday. Thanks for the mention as always & have fun with class!